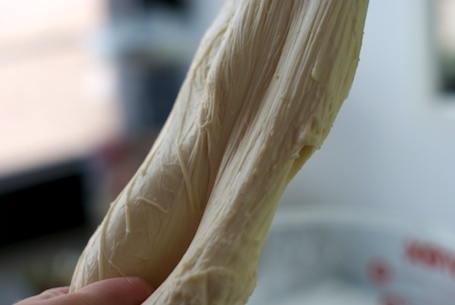 Making mozzarella at home is a fairly straightforward and satisfying process. Making delicious mozzarella – the kind that practically melts in your mouth and is served best with the tiniest bit of salt and olive oil – is an art form I have yet to master. The first challenge is to get the hang of curd forming: finding the right milk, making sure the temperature is accurate. Nine times out of ten it works, and sometimes it just doesn’t. The second challenge is knowing when to stop stretching so that your cheese is light and creamy. This, I think, takes years. I must admit, most of the fresh mozzarella I make ends up with a consistency that is great for pizza, but a little too rubbery for straight up eating. The truth is, while I would like to spend my time drizzling fancy olive oil on my perfectly stretched ball of fresh mozzarella garnished with the basil leaves I just pulled off that plant over there, the kind of cheese that gets eaten the most in my house these days is the lowly string cheese. And as it happens when it comes to cheese stretching, it is easier to overstretch than to under stretch (particularly when you are doing this activity with small children) – and overstretching leads, happily, to string cheese. 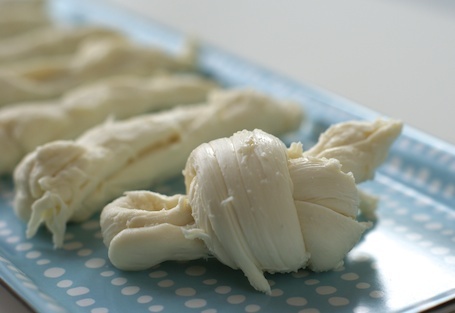 To get to string cheese, you start out with the same ingredients you would use if you were going to make the finest mozzarella: Whole milk that has been lightly pasteurized (this is highly important as ultra-pasteurized milk will not form a curd), citric acid, rennet and distilled water. Disolve 1 1/2 t. citric acid in 1 c. distilled water. Set aside. Pour one gallon of the best (non-ultra pasteurized) milk you can find into a very clean, non-reactive pot. Put the pot on the stove and stir vigorously as you add the citric acid. Keep stirring until the milk reaches 90º. Take the milk off the heat. Add the rennet mixture slowly while stirring the milk in an “up and down” fashion for 30 seconds. Cover the pot and let the milk sit undisturbed for 5 minutes. After 5 minutes, you take off the lid and hope that your curds have separated from your whey. You can tell when you press down with a spoon and it feels like custard. Take a long knife and cut the curd in two directions to make squares. Put the pot back on the stove and heat the curds to 110º while gently agitating the curds. This is tricky because you will get a different temperature reading depending on where you stick your thermometer, but you don’t want to heat beyond 110º, plus you are stirring with one hand, so pay attention. I highly recommend using an instant read thermometer – worth the investment if you are also making yogurt. Once you have reached the desired temperature, turn off the heat and continue stirring for 2-5 more minutes. 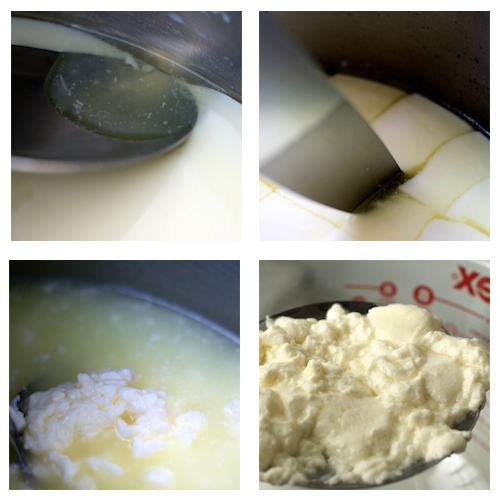 Next, separate the curds and whey with a slotted spoon, placing the curds in a bowl. At this point there are two methods you can use to heat the curds for stretching: the water bath method or the microwave method. 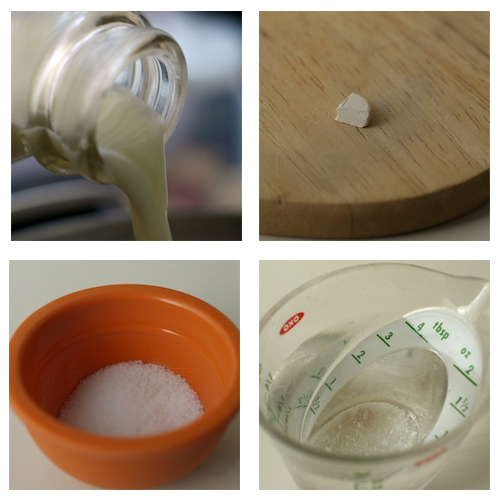 The goal of both is the same: to get the curds to 135º so they will stretch. I have done both and I have to admit, the microwave is easier. But either way, you heat the curds a bit at time, take their temperature, and squeeze out the whey (without squeezing too hard) to get the cheese to the point where it melts together for stretching. At this point, you may also want to add a bit of salt to taste. And then you stretch! I recommend wearing gloves because the 135º is hot to the touch and can make the cheese difficult to handle. This is where the art comes in. Like kneading bread, you get to know the feel of the cheese and when it is ready to be finished (at which point, you place it in the ice bath you prepared earlier). Or, you keep stretching and your children keep stretching until you pull off smaller pieces to form into logs and place them in the ice bath. One gallon of milk will yield about a dozen “stringles”, which actually makes this endeavor kind of economical. Plus, given the choice, what kid wouldn’t want to bring his or her homemade cheese sticks wrapped in wax paper to school? Okay, don’t answer that. It is, hands down, more delicious than packaged string cheese, though, and my kids love making it. So, there you have it: string cheese. Make it on Sunday, eat it all week! This entry was posted on January 5, 2012, 7:02 am and is filed under Dairy, kids, Recipe. You can follow any responses to this entry through RSS 2.0. You can leave a response, or trackback from your own site. Have you tried milk from the milk thistle? 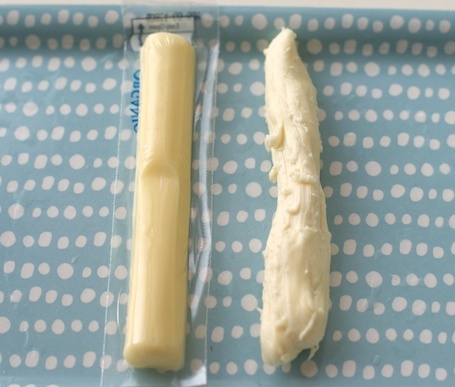 That is exactly what I used to make this string cheese! Delicious – totally worth the money. You are amazing! I’m still nervous about making my own cheese but I think I could definately do this! Hi there! If I can do it, anyone can! I suggest starting with a cheesemaking kit, like the one Ricki Carroll sells on her site. You can find them on Etsy, too. Totally simplifies the process and is a fun project to do with kids. Cheers! We bought a cheese-making book over a year ago, but still haven’t worked up the nerve or found the time to try it. My boys would love this, so you’ve given me the kick in the backside that I’ve needed. Thank you!